They fanned out across the neighborhood, knocking on doors and stepping politely through living rooms and kitchens that hadn’t been updated since their grandparents were children. They were African American youth from mostly low-income neighborhoods, spending their weekends applying caulk, weather stripping, and plastic to keep out the Chicago winter. The youth’s work is one of many green initiatives that rose out of a small but remarkably active south side church. Sixth Grace Presbyterian Church usually has less than 100 worshipers on Sunday morning, but their Green Team is empowered by a passion for environmental stewardship that would put mega churches to shame. It all started when Sharon Lewis returned to Chicago from a stint in Texas and met Veronica Kyle in the neighborhood. She discovered Veronica’s husband had interned at Sixth Grace, the church she’d grown up in. Kyle is Chicago Outreach Director for Faith in Place, an organization that empowers people of all faiths to be leaders in caring for the earth. Faith in Place creates dynamic partnerships that help churches, synagogues, and mosques put their faith and commitment environment stewardship into action. Barbershop Raps youth learn to weatherize a door. Back at Sixth Grace, Lewis recruited Cliff Wilkes founder of Barbershop Raps, a mentoring program for young men in the Bronzeville community. The church created the ministry in response to violence in the community. The barbershop is sometimes called the black man’s country club. Barbershop Raps is a place for young men to get a haircut and talk about issues in their lives. 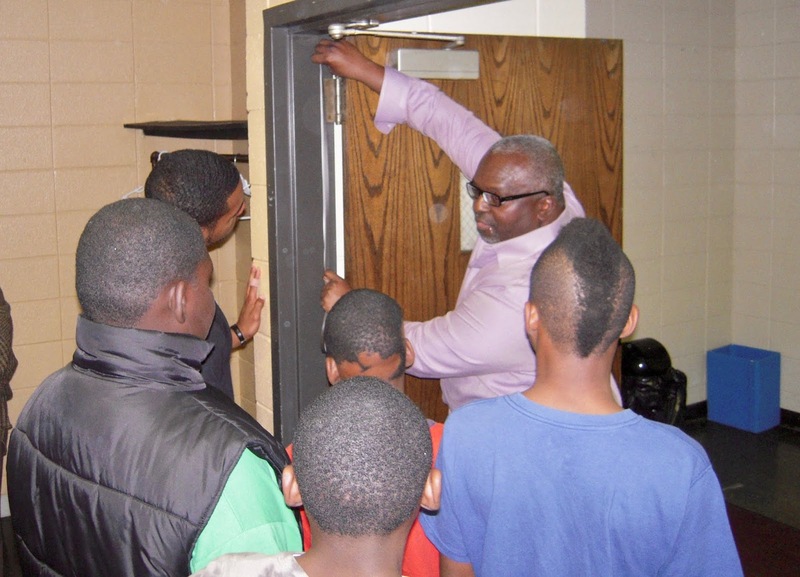 The young men of Barbershop Raps, some fifty strong, learned how to weatherize homes, track energy bills, and do simple things like turning off the water when brushing their teeth and turning off lights when they left the room. The youth spent many Saturdays going out into neighborhoods they often had never visited before, turning their environmental knowledge into action. An energy efficiency expert determined what each home needed, from insulation and caulking to an upgraded refrigerator, stove or furnace. The youth applied plastic and chalk to drafty windows. Thanks to generous grants and subsidies from ComEd, the local utility, residents were able to replace their aging appliances. As an added benefit, the residents, many of them elderly, were able to meet youth they might have been afraid of out on the streets. Through the partnership with Faith and Place, Barbershop Raps youth have become eco-ambassadors, staffing information tables at special events like a 3-on-3 basketball tournament in Mandrak Park, making presentations to churches, and taking field trips to energy efficient homes. Some of them have even gone on to careers connected with the environment. The Sixth Grace Green Team is embracing that responsibility, starting close to home. The Tenth Ward on Chicago’s far southeast side—generations of immigrants have worked, prayed, lived, and died here. The fumes from the slaughterhouses, steel mills, and oil refineries were the price residents willingly paid for solid blue-collar jobs. But over the last thirty years, most of the jobs left and this industrial corridor along the Grand Calumet River became home to even dirtier companies like S.H. Bell, a manganese storage facility, and two Koch brother-owned facilities that store petcoke, a byproduct of oil refining. The new businesses have few employees, but the fine dust that blows from their yards coats windows and lawns and has a major impact on the community. Manganese is a potent pollutant. In children, it’s linked to lower IQ scores and learning disabilities. When petcoke is inhaled, it can lodge in the lungs and cause serious health problems. The Tenth Ward is now predominately Latino, recent immigrants drawn by affordable housing and the proximity to jobs in Chicago. It’s the largest but least populated ward in Chicago. The families who live here bide their time and pray they can one day move to a healthier neighborhood. But not everyone in the community is willing to accept the status quo. Peggy Salazar is Director of the Southeast Environmental Task Force. She and a group of dedicated volunteers are pressing the city and federal governments to protect residents in this environmental disaster area. Salazar grew up on the southeast side and understands the resignation many residents feel. “People think it’s always been this way and there’s nothing they can do,” Salazar says. “They don’t want to live next to dirty industry if they can choose to live elsewhere, and those that can, eventually leave.” But Salazar feels a moral responsibility to the people who take their place. “When you sell your home, it just passes the problem along to the next person,” she says. Rev. 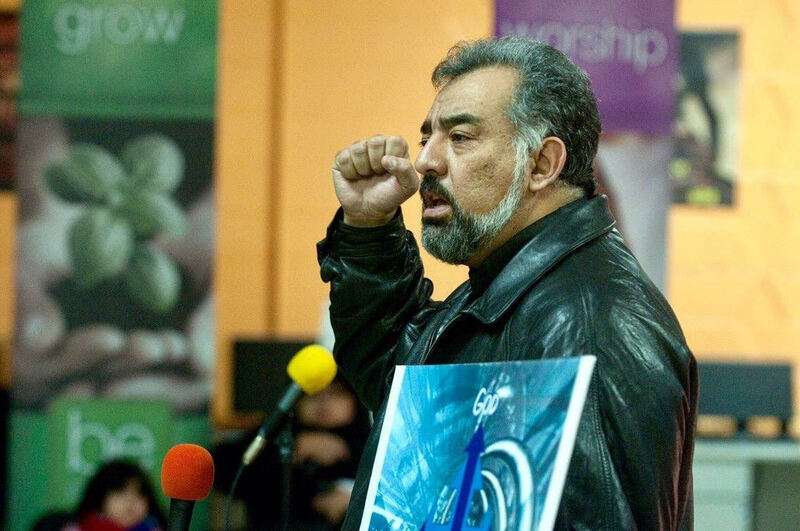 Zaki speaking at an environmental rally at The Zone. When Zaki found that parents were too burdened making a living to get involved, he turned to the youth. The church established the Southeast United Methodist Youth and Community Center, also known as The Zone, in 2002. It attracts scores of youth many of whom were eager to help their community. The coalition of community groups convinced the city not to issue a permit for the dump and the project died, but like a multi-headed hydra, polluters continued to be attracted to this vast, mostly empty industrial area. Leucadia National Corporation wanted to build a gasification plant across from a local high school to convert refinery waste and coal into synthetic natural gas. The process would release vast amounts of greenhouse gas and heavy metals. The community once again rallied against it. “We sponsored community information meetings and used grassroots organizing tactics,” says Zaki. Some 50,000 letters, many written by children, were sent to then Governor Pat Quinn. In 2012, the governor vetoed a bill to provide Leucadia subsidies to build the plant. The environmental battles on the southeast side will continue. In 2018, thanks to the work of Salazar and other activists, the EPA required S.H. Bell to install more air monitors to track manganese levels. But while looking for one toxic pollutant, they discovered lead in residential soil, where almost 6,000 children live. Salazar refuses to be deterred. She has a longer view of how to save her community. “There’s a lot of open space here,” she says, “the only large natural areas in Chicago.” Salazar would like to eventually see the Grand Calumet River and its tributaries restored to a more natural state. She imagines the Tenth Ward as a place where tourists stop and enjoy the scenery and wildlife instead of rushing by on the expressway. “Things move slowly on the southeast side,” Salazar admits. But when people come together to work for change, there is always hope. For Rev. Dr. Jerry Cannon, Senior Pastor at C. N. Jenkins Memorial Presbyterian Church in Charlotte, NC, healing the mind, body, and spirit is an essential part of healing the earth. In 2016, Rev. Cannon attended a summit in Baltimore sponsored by Green the Church, an initiative designed to tap into the power and purpose of the African American church community. After hearing other black church leaders talk about the role of churches as centers for environmental and economic resilience, he invited Rev. Ambrose Carroll, Green the Church’s founder, to bring the next summit to Charlotte. “We held the summit in conjunction with our annual preaching revival,” Cannon shares. The theme became “Revive us Again: The Black Church Response to Climate Change and Global Renewal.” Participants spent the morning finding spiritual renewal and the afternoon talking about renewal of the earth. For Rev. Cannon and Jenkins Presbyterian, the commitment to improving lives while saving the planet didn’t end with the conference. The church partnered with the Mecklenbury County Health Department to create a program focused on improving diet and exercise in the community. They are also encouraging their members to join the upcoming Ecobible Study and Mission Enterprise at Mayfield Missionary Baptist Church in Charlotte, led by Dr. Covia Boyd from Union Institute & University. The study focuses on how economic opportunity connects with environmental stewardship. 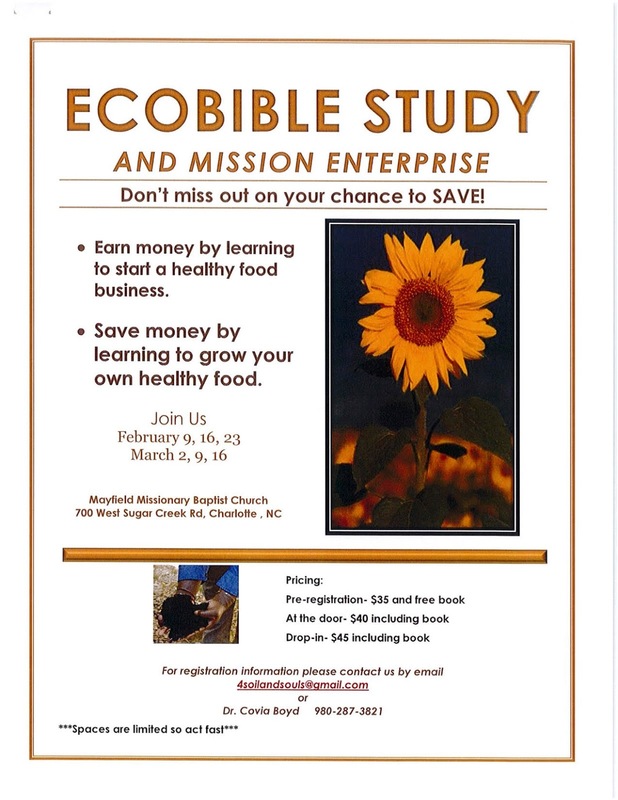 Participants will learn how to save money by growing healthy food, and how to earn money by starting a healthy food business. Asked how he would encourage more African American churches to join the green movement, Rev. Cannon says, “You have to invite people to come and see.” C. N. Jenkins Church is offering that invitation, one garden plot and one healthy lifestyle at a time.